Where do I use my Ernest Jones voucher code? Find the Code or Deal you would like to use from NetVoucherCodes. Follow the link through to Ernest Jones. Fill up your shopping cart then select the basket icon in the top right-hand corner to check out. Insert your discount code into the box titled ‘Add a Promo Code’. Select ‘Apply Code’ and ‘Checkout Securely Now’ to continue to the checkout process. "4 years interest-free credit with 0% APR." "Sign up to the newsletter for exclusive offers and deals." Popular high street jewellers, Ernest Jones are renowned for their quality diamond jewellery and watches. In addition to exquisite diamonds, at Ernest Jones, you will also find jewellery made from gold, silver, platinum and palladium with other colourful precious and semi-precious stones. There’s also charms and beads, pearl earrings, personalized jewellery and pieces from popular brands like Gucci, DKNY, Emporio Armani and many more. At Ernest Jones, you'll be impressed with a breathtaking collection of sparkling jewellery, including engagement rings, eternity rings, necklaces, bracelets, earrings, watches and more, in both classic and contemporary designs. 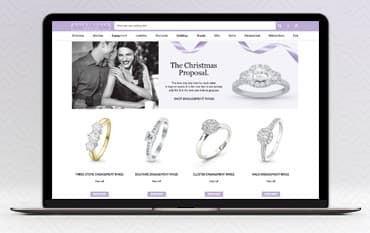 Browse the latest trends in fashion jewellery, such as stunning cocktail rings and vintage-style pieces, or make something special for a loved one with the bespoke jewellery personalisation range. Amongst Ernest Jones’ prestigious brands are some of the finest names in the business including TAG Heuer, Gucci, Emporio Armani, Rado, Omega, Dreyfuss & Co and Longines. The coveted Leo Diamond with its unique, patented precision cut and superior brilliance is also available exclusively through Ernest Jones. The watches at Ernest Jones are manufactured by some of the most prestigious brands in the world such as Longines, TAG Heuer, Bulova, Montblanc, Omega, Tissot and many more. Ernest Jones provide collections which include both male and female styles with cases made from all types of metals including gold, silver, steel, chrome and titanium. As well as a variety of materials you can also discover a myriad of watch styles suitable for all occasions with everything from cocktail watches to waterproof sports watches as well as brushed stainless steel items with rotating bezels to chronographs, right through to ladies rose-gold timepieces complete with rhinestones and colourful wristbands. If you’re looking for a thoughtful gift for a loved one choose a watch from Ernest Jones. Watches are timeless pieces that last for decades, fused with sentiments of true love, commitment and, of course, style. And thanks to some of our great deals, discounts and offers available from Ernest Jones, you can buy watches and any other pieces of jewellery for less! Whether you’re searching for the perfect engagement ring, wedding ring, or eternity ring, or simply just a dress ring to complete your outfit, you are bound to find something from the extensive choice of rings at Ernest Jones. In this remarkable collection, you will find both men's rings and rings for women in a variety of metals including all colours of gold, silver, cobalt, palladium, platinum and tungsten featuring diamonds, emeralds, rubies, sapphires and many more precious and semi-precious stones. Add the finishing touches to your occasion outfit or introduce a hint of glamour to an everyday look with earrings from Ernest Jones. Whether you require simple studs for casual uses, elegant drops for sophisticated events or stylish gold hoops to remain both suave and trendy, you can find them all in the collection at Ernest Jones. Here, you’ll mainly find earrings for women although there are also choices for men and cute little stones for children as well. Shop for earrings from huge brands like Calvin Klein, Links of London, Michael Kors, Swarovski, Vera Wang and more to discover high-end pieces for affordable prices. You can return your order back to Ernest Jones within 30 days of purchase for a full refund. Ernest Jones is one of the UK's largest retailers of fine jewellery, diamonds and watches, with over 180 stores around the UK. Here you will find an extensive choice of diamond jewellery, including engagement rings, eternity rings, necklaces, bracelets, earrings and so much more from huge brands like Gucci, Emporio Armani, Mont Blanc and Hugo Boss. Make sure you use our Ernest Jones voucher codes to receive a discount when investing in jewellery or check out our offers and deals to cut the cost of your purchase. We are constantly on the hunt for first order Promo Codes for Ernest Jones to help you with your money saving. Our experts check dozens of sites for secret codes including NHS discounts, student sites & social media channels saving you time & money!